Dental implant supported tooth replacement is fast becoming the gold-standard in smile restoration. Because dental implant posts replace the roots of teeth, your entire smile is restored, creating a closer to natural end result than is possible with any other treatment option. The process is completed over the course of many months, and it can require several visits to our office. However, the results are long lasting and for many patients, an implant supported replacement tooth will last their entire lifetime. At D’Amico & Mauck, DDS, we are happy to provide a wide range of tooth replacement options in our Aurora dental office. Whether you need to replace a single tooth or many teeth, our team can help. Contact us to learn more or schedule a tooth replacement consultation appointment with our skilled dentists and dentistry team. We look forward to helping you recreate a healthy, beautiful smile. Services to renew oral health for those suffering from chronic conditions like gum disease. The extraction of one or more damaged or decayed teeth. The placement of a bone or tissue graft may be necessary to improve the amount of supportive tissue available to retain the dental implants. 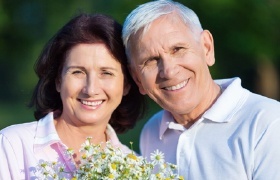 Following your preparatory treatments, we will surgically place your dental implant posts. This procedure is not as invasive as it may sound. We make a small incision into the gum tissue. Then, the implant posts are positioned directly into the jawbone. Once in place, we attach a protective cap that will allow the implant site to heal while maintaining the shape of the gum tissue in order to attach the replacement teeth. Once the implant posts are in place, they will need to fuse with the underlying bone and gum tissues over the course of several months. This process is called osseointegration, and it is the key to recreating the lost tooth structures and restoring your smile. After the implants have fully fused with the jawbone, we’ll attach abutments. These pieces are used to connect the implants to the replacement tooth or teeth. Once the abutments are in place, we design your final restoration capturing impressions that will be used by our lab to craft your dental crown, fixed bridge, partial, or full denture. 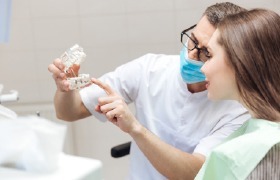 Once we receive your final dental restoration from our skilled lab, you’ll return to our office where we’ll affix the crown, bridge, or denture to your implant posts. Once in place, the implant-retained prosthetic will look, feel, and function just like your healthy, natural smile. Don’t wait to seek an implant-supported tooth replacement. Contact the office of D’Amico and Mauck DDS to discuss your tooth replacement options in Aurora, CO! You can also request your appointment online. 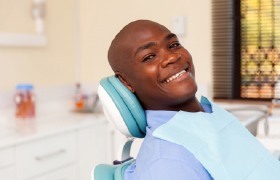 We are happy to provide comprehensive dental care in a warm environment where you’ll always know that you come first.